Excitement and anticipation turned to feelings of dread and nausea, followed by hope and then, finally, elation. Just your average Arsenal game. I suppose that's why we love this club so much - they take us to the brink of despair only to bring us back (usually) to glory. That's what makes this so much sweeter. We did it the Arsenal way. We are the FA Cup Champions. The number of Gooners that turned up at this small pub outside Detroit to watch the game was epic. I've lived in the United States for 17 odd years, and when watching games in the past we'd be lucky to get a dozen Gooners together. 50 or 60 passionate Arsenal fans turned up to watch their team and sing for 3 hours straight. There's was a brief moment of silence when the first goal, then the second went it so early, but the fact that Arsenal have such a following so far away from North London is a great feeling. To be completely honest, the first goal didn't spark that feeling of complete despair at first, just the feeling of 'here we go again' although I think the general feeling was that we could come back from 1-0 down. Two goals down is another thing all together. When that second goal went in is when the faces dropped and that sick feeling began to creep in. It wasn't over, as Gibbs saved us from going three goals down with a header off the line. I would go as far as saying we pretty much dominated the rest of the game, aside from one or two decent chances from the Tigers. Cazorla's free kick was spectacular and came at precisely the right time. Koscielny popped up to redeem his earlier defensive frailties by turning on a dime to level the game at 2-2. You knew Aaron Ramsey would show up and do something special at some point, as he's been doing it all season (when he's not injured). He capitalized on one of our many, many chances to win us the game just few minutes away from a penalty shoot out. Pandemonium. After the game many of the players made the point that we had silenced the critics and that dark cloud of trophy less seasons had now been swept away. We are, however, Arsenal Football Club, and those critics will find other ways to draw negatives from a very positive result. How some people, including the Hull manager, managed to figure out that Arsenal received the better of the referees decisions Saturday afternoon is mind blowing. I counted at least a couple of solid penalty shouts that were turned down. 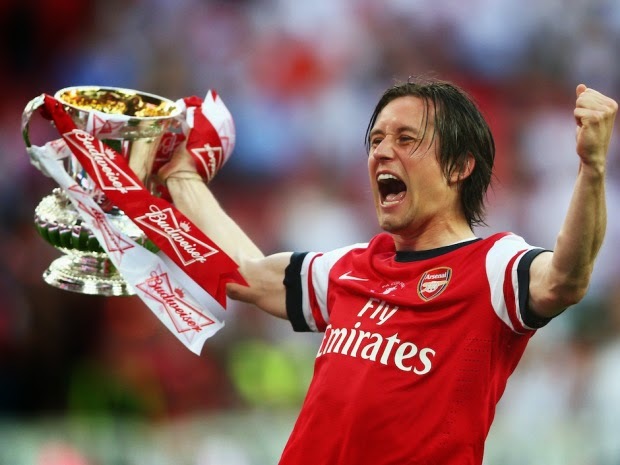 As I said - We are The Arsenal, and it's that sort of energy that makes winning this cup so much more satisfying. Each and every one of us sat there and watched that game, and we know we deserved that win and we deserved that trophy. It has now been about 24 hours since Arsenal last won a trophy... Wenger out! I kid, I kid. The managers decision to start Fabianski resulted in mixed feelings. Some, including myself, thought that the final league game against Norwich was the Pole's 'goodbye' to the club, but apparently it was an attempt to keep him sharp before the final. I'm not blaming Fabianski for the goals, although he did look very, very shaky at points (last couple of minutes... open net??!) but I think I would have been more comfortable with Szczesny in goal. He is our #1 after all. You can't help but be glad for Fab though. He did a lot to get us to the final in the first place, and made a couple of good saves to help us win the final. I doubt he will stay at the club, but as I said before, I think he'd be welcome back with open arms if he was willing to stay as back up. Another player that may have played his last game for Arsenal was Bacary Sagna. Another solid performance from the Frenchman, and if he does leave, what a way to go. Many Arsenal fans got their first taste of Arsenal success on Saturday, and I'm confident this is the first step into a new era for Arsenal Football Club. We'll see what happens in the next week or so in regards to certain players and managers and their contracts, but if we can keep the core of this team together and build on it I see no reason why we can't add to our trophy cabinet next season. It's sad that the Arsenal season is over, but the boys in Red & White made sure to extend it as long as they could. Sp*rs and Chelski fans have already watched an entire season of Game of Thrones since their season ended. I wanted to touch on this whole "Specialist in failure" comment that Mourinho made a while back, but I think lifting that trophy on Saturday said it all. The poor little Portuguese knob-end really did make an utter fool of himself this season, and I hope he doesn't get sacked so we have someone to laugh at next season. 2013/14 FA Cup Winners - Arsenal Football Club. Has a nice ring to it.